D-Chowk flash in the pan? So another D-Chowk protest sit-in, after causing losses to the tune of millions of rupees to the state and considerable anxiety to the citizens, ended with no more than a vague ‘verbal’ assurance to the protesters that their demands will be considered. The PML-N government once again successfully followed the prototype developed by the PPP administration in dealing with capital sit-ins. Remember what happened when Tahirul Qadri, along with several thousand devotees, was allowed to set up camp in D-Chowk before the last elections. Well, he was offered no resistance and thousands of his well-disciplined devotees which included men, women and children braved harsh cold winter showers under the open skies to hear their leader proclaim a revolution was round the corner. The military wasn’t about to throw the government to the wolves. Eventually, they dispersed after an ‘agreement’ was concluded over issues including electoral reform with the question of ‘how’ and ‘when’ of the agreed changes left hanging in the air. It was of little concern to anybody that the Constitution did not provide for any such changes to be incorporated into the law without an amendment. Then of course the same manual was used when Imran Khan’s now fast-fading-from-memory dharna was staged in Islamabad. On each of these occasions it was clear that the government felt it needn’t do anything radical which could inflame passions further. Time, it had been believed by the then PPP government, was on its side. The PML-N sat out the challenge. In the end, having taken their campaign to a climax with the sit-in, its leaders had nowhere to go but back and their cause seemed to have suffered irreparable damage. Not least because later it transpired that these pressure tactics were being orchestrated by a section of the establishment with not-so-kosher motives. Notwithstanding the justified anxiety of the many liberals who wanted the government to forcefully protect public property, uphold the law and hold to account the abusive, foul-mouthed protesters, the latest round wasn’t so easily or quickly attributed to the machination of the establishment. In fact, if a weekly newspaper usually with solid sources in the PML-N and also the military/intelligence establishment is to be believed the army chief called Justice Asif Khosa, after the latter penned the landmark judgement dismissing Mumtaz Qadri’s appeal in the Salmaan Taseer murder case and upholding the murderer’s death sentence. The COAS, according to the newspaper, thanked the revered jurist for standing steadfast and extended to him assurances of foolproof security, offering to assign commandos to his security team and providing an armour-plated car to travel in. The paper’s story wasn’t clear if the offer was actually accepted. But what was clear was that the government’s decision to execute Qadri, which surprised many commentators who felt certain the man would be left in prison for the rest of his life so as not to stir the hornets’ nest, had the full backing of the military. The military wasn’t about to throw the government to the wolves — in this case supporters of Qadri — after having endorsed and supported his execution. So what then were some of the dynamics at play? 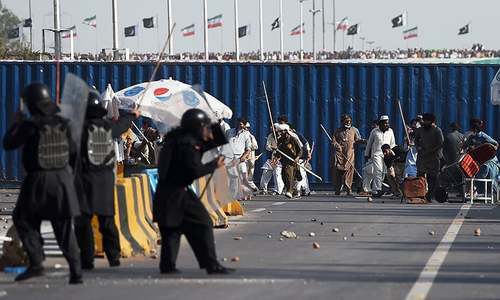 Well, it is said, when the Barelvi organisers of Qadri’s chehlum approached the government they gave an undertaking they’d congregate at Liaquat Bagh, and disperse after their commemoration. The assurance was extended, among others by the firebrand Maulvi Hanif Qureshi (do sample some of his virulent sermons on YouTube). He is the same man who had earlier submitted an affidavit to the trial court saying he didn’t ‘know any Mumtaz Qadri’ after he had been accused of radicalising Salmaan Taseer’s killer. However, the Barelvi leadership isn’t exactly monolithic. The leader of the Karachi-based Sunni Tehreek, the organisation that came to the fore back in 1992 when one of the first attempts to clip the MQM’s wings was made, had other ideas. 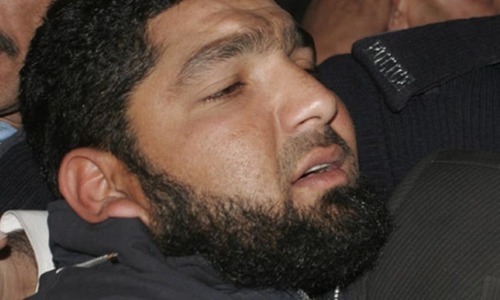 After receiving the establishment’s backing in its love-hate game with the MQM, as a counter to the ethnic-based party, and securing its foothold in several Karachi neighbourhoods with protection-extortion rackets to rival or complement those of other groups, the latest Rangers-led operation in Karachi was said to have also targeted and hurt the Sarwat Ijaz Qadri-led ST. 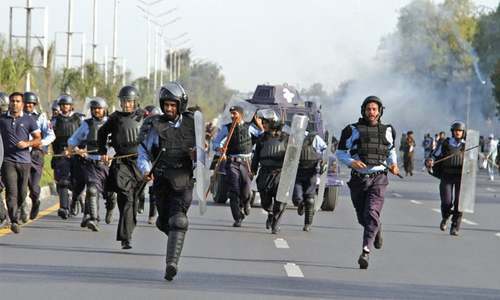 So when the organisers seem­ingly tore up the agreement with the Rawalpindi administration of dispersing peacefully after prayers for Qadri, a group of leaders egged on by the ST chief started to marshal their supporters to march towards the capital. Among those who marched to the capital were also the followers of Multan-based cleric Hamid Kazmi, whose Barelvi power base has come under threat over the past several years from apparently state-backed Deobandi groups. 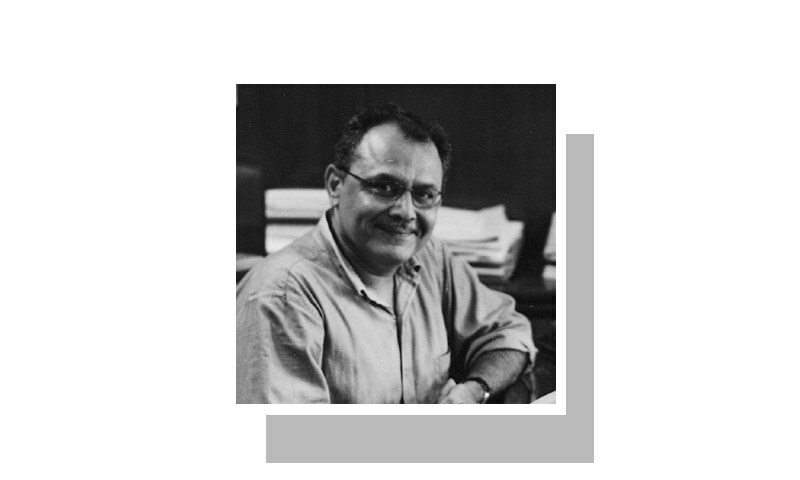 Mr Kazmi was a minister in the last PPP government and remained incarcerated for a long period at the Supreme Court’s orders after he was cited in a scandal involving misappropriation of funds earmarked for the Haj pilgrimage. Although normality has now returned to the capital, it isn’t clear whether the cause célèbre provided by Qadri’s execution will continue to be an effective rallying cry for the majority Barelvi Sunni Muslims. 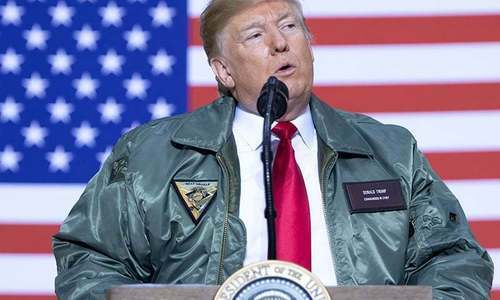 For years, they have watched from the sidelines as the minority Deobandi Sunni Muslims have received state and foreign (read Gulf) largesse and acquired extraordinary clout and power in return for providing the foot soldiers for jihad in such varied locations as Afghanistan and further afield in Central Asia and India-held Kashmir. At a time when the establishment-Deobandi relationship seems finally to have hit rock bottom, there will be no greater irony if the Barelvis decide to assert themselves. The consequences for Pakistan could be devastating. Let’s just hope like other D-Chowk protests, the latest turns out to be a flash in the pan too. Next time there will not be such condition. The country cannot be run this way for very long. Before the deluge their are warnings. Article is based on too many assumptions. Ch Nisar ,please have mercy on us and seek a change of your portfolio. A feeble spineless government capitulates to all threats to its rule, no matter how hollow or impractical. Instead of charging them hordes for disturbing the peace, and destruction of property, they were simply allowed to fade away and go back to their bases...Only to resurface again soon, I;m sure with much more zeal and fervor, without any fear of consequences of their criminal acts. A precedent has been set for all to challenge the writ of the government through such methods, and that government will cave in lest its seats are shaken! Hanif Qureshi should get arrested for his voilent sermons. These clerics don't have any sense of civilisation. They are still living in barbaric past. Mustafa Kamal 'Ataturk' of Turkey, originally, was facing almost similar problems caused by the 'mullahs' in the name of religon. He tackled them so smartly and so tactfully that he came to be known as 'Maker of the Modern Turkey'. In fact by providing the right to women to vote, and showing the world the difference in being ' Modernized' and in being 'Westernized', he got appreciation of great leaders like The Quid-e-Azam, and Al-lama Iqbal. As such there is a lot to be learned from history. Simply superb analysis on the part of the the learned writer which is full vigrous insights and source of adding an extra understanding about not only the current issues at hand but also the way a state functions deliberatly or based upon expediency. Amid this state-sect allience one thing should not be forgotten is the existance of numerous other sects hitherto unaccounted for and on occasions totally marginalised. What the state right now in need is the necessacity of striking a narrative of forging an allience by judiciously taking on board all the sects in the country based upon not on majority but on the basis of merit and secrifice for the nation. You may consider this suggestion an akward one but right now at this juncture of time the nation desperately needs it if we think that we can compete with the dictates of the vested interests. The policy makers have the choice of reviewing the progress of alliences made with sects/groups/entities to reach at a conclusion.